The classic Dove style acoustic first introduced at the legendary Gibson and Epiphone factory in Kalamazoo in 1962 became one of the first acoustic guitars to become a recognized rock and roll icon. Now, both beginners and professionals can enjoy the classic sound of The Dove plugged in with the Fishman™ Sonitone™ soundhole preamp and Fishman™ Sonicore™ pickup system, designed and built with the integrity you expect from Epiphone. Unplugged, the Epiphone Dove PRO can easily drive an acoustic band. But plugged in, The Dove PRO can hold its own with drums and electric guitars. Though there are many of guitars that claim to be "historic" or "vintage" styled, only one comes with a Limited Lifetime Guarantee and Gibson 24/7/365 customer service and the experience of a century of guitar making. Start with the best. Visit your Authorized Epiphone Dealer today and plug in with the Epiphone Dove PRO Acoustic/Electric today. 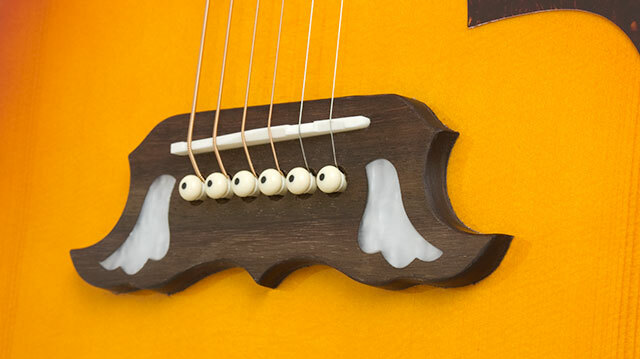 Pickguard imitation tortoise with traditional “Dove” artwork Nut: 1.68"
The Dove PRO Acoustic/Electric has a beautiful Violinburst color finish and features a solid spruce top with 5-ply white and black binding. Spruce is a rich and complex tonewood that begins to breath and improve with age the more its played. The more you play, the better it sounds! The body back and sides are made from select maple for a punchy, bright tone. The body back has single ply white binding. The hard maple 25.5" scale neck has a SlimTaper™ "D" profile and is glued to the body using a dovetail joint and TitebondTM glue. The fingerboard has singly ply white binding and features a 12” radius with 20 medium frets, a 1.68” nut, and pearloid parallelogram inlays. The bridge has pearloid dove inlays just like vintage models. The saddle is compensated and is made from imitation bone. The classic “Dove” tortoise shell style pickguard is easy to spot on stage and is one of The Dove’s most famous features. Epiphone is proud to re-introduce the classic Epiphone Dove PRO Acoustic/Electric with the superb Fishman™ Sonitone™ preamp and Fishman Sonicore™ pickup system. Fishman™ is an industry leader in bringing a guitar’s true acoustic tone to bigger stages. The Sonicore™ pickup is set underneath the rosewood saddle. 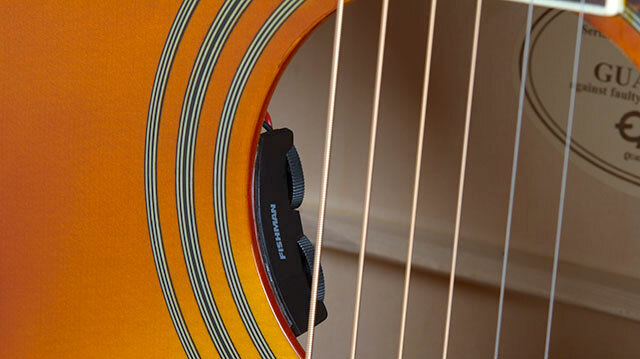 The Sonitone™ sound-hole preamp is an active preamp mounted in the soundhole with easy-to-access mounted rotary controls for Master Volume and Tone adjustment. Now you can make your adjustments during soundcheck and even fine adjustments on-the-fly during your set. No more running back and forth to your amp or the soundboard! Finally, your tone is in your hands right where you need it. The active preamp is powered by a single 9-volt battery. You can connect your Epiphone Dove PRO Acoustic/Electric to a PA or amp of your choice with a standard ¼” instrument cable. Batteries typically last up to 100 hours. 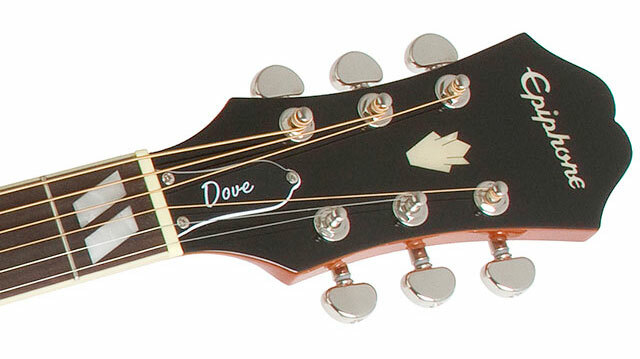 The Dove PRO comes with Grover 14:1 tuners and nickel strapbuttons, a combination ¼" output jack and endpin, and D’Addario Phosphor (12-53) strings installed at the factory.